Titanic Blu-ray IS a breathtaking film submerged in clarity and quality. 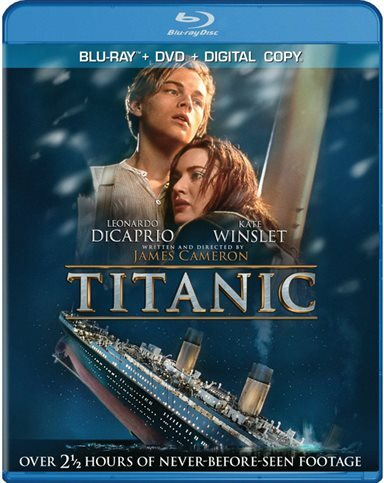 One of my most beloved romance movies Titanic has come to video in a Blu-ray, DVD combo pack with all the bells and whistles for your complete home entertainment enjoyment. Available in High Definition for the first time, this romantic adventure gives an extraordinary presentation on your Blu-ray player. Whether you missed it at the movies when it was released or just want to relive it again this combo pack comes as close as you can get to the movie theater experience. Most everyone knows the story of Jack (Leonardo DiCaprio) and Rose (Kate Winslet) who met on the mighty ship Titanic that was making its maiden voyage. Their love grew as Rose became enamored with the daring young vagabond and artist who came from a very different station in life, showed a vibrant personality and expressed dreams of a new beginning. Accompanying her wealthy parents, Rose kept to the upper class decks with third-class passenger Jack taking chances mingling with the wealthy. It was a whirlwind affair that saw the two meeting as much as they could whether it on deck at night, dancing with gypsies in lower class or in the very low levels where cargo was kept. But their love for each other would have another fate that wasn't as enchanting in the form of one of the world's most incredible disasters, the sinking of the Titanic. The chemistry between DiCaprio and Winslet burns the screen in this amazing adventure that follows the star-crossed lovers from Titanic's port of debarkation to the watery grave in the depths of the sea. The most memorable scene shows the two at the front of the ship, Rose with outstretched arms seemingly flying in the wind while Jack holds her. Not many films can hold a candle to this love affair written by James Cameron, and under his direction the two actors do it justice. The cinematography and special effects that capture the voyage and love affair make the film one of the all time greats. The dancing, liveliness, and excitement aboard the Titanic and then the chaos, courageousness and sinking of the huge ship are caught in the many cameras used under the fine direction of Oscar winner Russell Carpenter (True Lies, Charlie's Angels). Using special visual effects from ILM (Industrial Light and Magic) under the supervision of Dave Carson (Star Wars), additional effects lead by Donald Pennington (Ghost Busters), intricate sets from designer Peter Francis (Harry Potter, Batman Begins) and Academy Award winning sound effects designer Christopher Boyes (Pirates of the Caribbean, The Avengers) Cameron puts his audience into the merriment, conflicts and destruction of the super cruiser. I would be remiss if I didn't mention the Academy Award winning haunting love song sung by Celine Dion, "My Heart Will Go On" and the score lead by music supervisor Randy Gerston (True Lies). The music ties the film together giving it the enchantment that makes Titanic memorable and in DTS HD it enhances the entertainment value. The complete experience of watching this huge ship sink into the sea while the band plays, the chaotic scene of people running for their lives to insufficient life boats, water filling the lower levels trapping passengers and crew and the splitting of the ship are amazingly presented by the filmmakers. Winner of 11 Academy Awards in 1998 including Best Picture, Best Cinematography and James Cameron – Best Director, the movie went on to be the highest box office grosser of all time amassing $2,185,372,302 (includes the 2012 re-release totals). The Visual Quality of the Blu-ray is quite amazing. Bright and clear, it's like being there amidst the adventure and the disaster. Presented in 1080p high definition for the first time in home using your Blu-ray player, Titanic will live on for repetitive viewing. The Sound Quality depends on you entertainment system with the availability of 5.1 DTS-HD Master Audio incorporated into the Blu-ray disc. If you have a surround system, ramp it up for the disaster scenes and the clarity of sound will frighten even the hardnosed viewers as they listen to the breaking of the ship, screams of the passengers and rushing of the water into the state rooms and over the decks. If the movie isn't enough then check out the 2 ½ hours of special features packed into the 4 disc box set. You will be treated to two new documentary features "Reflections on Titanic" and "Titanic: The Final Word with James Cameron" along with 60 behind the scenes documentaries, and 30 Deleted Scenes. See the following for a complete breakdown of the 4 discs in the box set. Titanic: The Final Word with James Cameron—NEW! Download Titanic from the iTunes Store in Digial HD. For more information about Titanic visit the FlickDirect Movie Database.